George Clooney and his wife will be hosting 2 fundraising events for Hillary Clinton. with The L.A. event co-hosted by Marilyn & Jeffrey Katzenberg, Kate Capshaw and Steven Spielberg and Cheryl & Haim Saban with more co-hosts to be announced at a later date. The other will be in San Francisco also with George and Amal as hosts. There is a raffle so even some lucky common folk can attend. 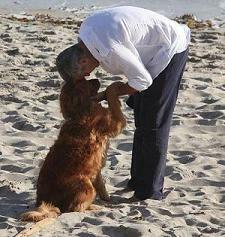 Gossip Cop deny George Clooney was caught kissing a mystery blonde claimes by The Enquirier. The lady in question is Dominique Lemmonier whose husband Alexandre Desplat a renowned film composer who has worked with George many times and who was at the dinner.